While visiting Northern Wisconsin this weekend I was able to fit in a flight. I wanted to re-familiarize myself with flying to an airport within Class C airspace. I decided to fly to Green Bay's Austin Straubel International Airport (KGRB) which is in Class C airspace and is just a short 37 mile flight from Door County's Cherryland Airport where I often rent from. Class C Airspace typically surrounds airports in mid-size towns like Green Bay, Dayton or Milwaukee. Airplanes that wish to operate within Class C Airspace must have a Mode C Transponder that allows ATC to track the airplanes altitude. Class C Airspace also has a 200 knot airspeed restriction below 2,500 feet but that of course is not an issue in the Cessna 172. Unlike the stricter Class B airspace pilots are not required to receive permission to enter Class C airspace but must achieve radio communications with ATC. Once ATC has replied back to your request you can enter the space, unless they specifically request you stay clear of the airspace. From the point of contact forward the pilot is to comply with any ATC instructions as long as they don't pose a threat to the flight. When I was twenty miles from the Green Bay Airport I contacted Green Bay Approach and explained I was 20NM to the Northeast and was inbound for landing. Approach control gave asked me to Squawk 0324 and verify my altitude at which point they were able to make a positive identification of my plane on their radar. They asked me to proceed inbound and to expect right traffic for runway 36. As I closed in on the airport they gave me vectors that would put me into a right base for runway 36 behind a commercial CRJ flight that was on final. There was plenty of separation between the CRJ and I which meant wake turbulence would not be an issue. Runway 36 at KGRB is a mammoth runway that is 150 feet wide and over 8,700 feet long, nearly three times as long as most runways I typically use. I landed close to the numbers which meant a long slow taxi to Executive Air a nice FBO which is situated at the other end of the runway. I popped in there quickly before preparing for the return leg. Just a week earlier this tarmac had been filled with reporters when Brett Favre made a quick return to Green Bay before being traded to the N.Y. Jets. When departing I was offered the ability to depart from the midway point of runway 36. Turning onto runway 36 I still had more than 4,000 feet of usable runway and was airborne quickly. Upon departing the airport I had a nice view of Lambeau Field, home of the Green Bay Packers. From there it was a short twenty five minute flight back to the quiet Door County Cherryland Airport. During the flight back I had my eye on an storm that looked to be approaching the Cherryland Airport. The storm waited for me to land and shut down the engine before releasing it's rain. Another fun flight in the books! So glad you beat the rain back to Cherryland! I bet you can't wait to repeat that flight - in hopefully better weather! I just flew into Class B tonight. Whew. I was just getting comfortable in D when my instructor 'made' me go to KORL. Oh well, I have to learn! Sounds like a lot of fun. I'm looking forward to the day I get more comfortable on the radio. For example, here in Australia we do not have Class B airspace at all. Major airports are in Class C airspace. BUT Class C airspace here requires a clearance to enter, which from what you say is very similar to Class B in the US. Class D in Australia is just like Class C, you need a clearance to enter, the difference being that controllers do not have a radar, hence the operations are purely procedural since the controllers rely on reports from pilots to know where aircrafts are. 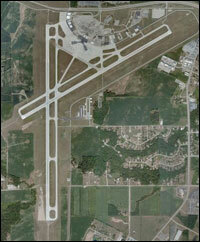 Class D airports are usually found around regional airports with less traffic than Class C airports. I wonder whether all countries are different in their use of airspace classes, or if it is a case of most countries sticking more or less to ICAO standards and the US deviating from it, as is the case with the format of flight notification forms. It is interesting to learn about aviation and airspace in countries other than your own. I wish I had taken the opportunity to schedule a general aviation flight when I was in Australia a few years back. I often try to schedule flights now when I travel. Hello guy, fascinating weblog! I'm becoming a member of the actual Feed.